Belgian Minister Says Government Lacks Control Over Muslim-Dominated Neighborhood Linked To Paris Terror Attacks – UPDATE: Area Called A “No-Go Zone” – UPDATE: Official Calls Area A “No-Go Zone”..
Belgium’s home affairs minister said that the government does not “have control of the situation in Molenbeek,” a working-class neighborhood of Brussels that has been linked to several terrorism plots in recent years. Speaking on the VRT television channel on Sunday, the minister, Jan Jambon, said that the government would “step up efforts” to bring order to the area of the Belgian capital. Prime Minister Charles Michel of Belgium said he was also concerned about jihadist networks in Molenbeek. Belgian officials had said that the brother of one of the men suspected to be Paris attackers was arrested on Saturday in Molenbeek. 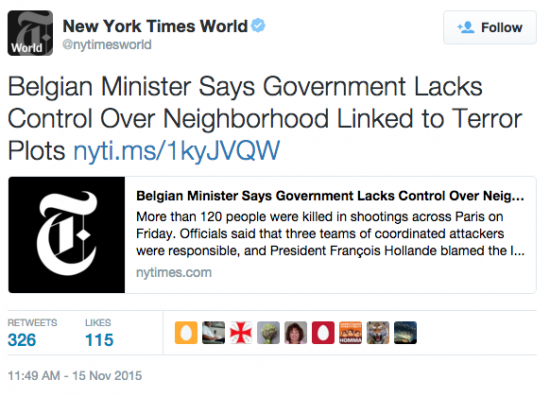 UPDATE: I could have sworn the liberal media declared the concept of “no-go zones” in Europe a myth. …. As well as being home to many ethnic Moroccans and Turks, Molenbeek is also one of the country’s poorest areas. It has a 30 per cent unemployment rate, and one in four of its 95,000 inhabitants does not have a Belgian passport. Like gang violence, Islamic radicalism has fed on Molenbeek’s marginalisation, despair and festering resentment of authority. Police say the most dangerous among around 30 Brussels gangs come from Molenbeek.